Prior to the Cardinals Dinner, guests gathered for Mass at St. Bernard of Clairvaux Catholic Church in Scottsdale. Cardinal Francis George, archbishop of Chicago, greets Bishop Thomas Olmsted of Phoenix. From left, Cardinals Edward M. Egan, Roger M. Mahony, Justin F. Rigali, Francis E. George, O.M.I., Cardinal Sean Parick O'Malley, O.F.M. Cap., and Daniel DiNardo at the Mass before the 2011 Cardinals Dinner. Catholic University President John Garvey, his wife Jeanne, Provost James Brennan and his wife Mary attend Mass Mass at St. Bernard of Clairvaux Catholic Church in Scottsdale, Ariz., prior to the Cardinals Dinner. Bishop Olmsted delivers the homily at the Cardinals Mass. Bishop Olmsted greets the congregation. 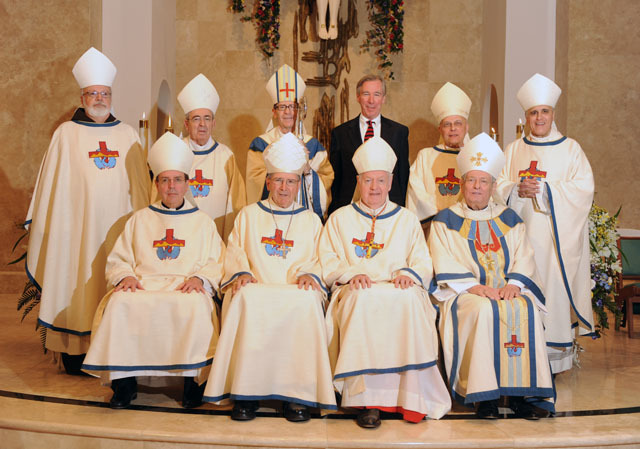 From left to right (seated) Archbishop Allen H. Vigneron, Cardinal Roger M. Mahony, Cardinal Edward M. Egan, Archbishop Pietro Sambi; (standing) Cardinal Sean Parick O'Malley, O.F.M. Cap., Cardinal Justin F. Rigali, Bishop Thomas J. Olmsted, CUA President John Garvey, Cardinal Francis E. George, O.M.I., Cardinal Daniel DiNardo. Cardinals and guests gather before dinner. President Garvey tells those gathered that CUA has "the best students in the world." Cardinal Justin F. Rigali, archbishop of Philadelphia, and Cardinal Sean Patrick O'Malley, O.F.M. Cap., of Boston meet the Garveys before the dinner. Cardinal Mahony, archbishop emeritus of Los Angeles, President Garvey, Bishop Olmsted, and students (from left) Vanessa Vasquez, Chris Pierno, Courtney Riccio, Olivia Povedano, Pam Tremblay, Ryan Winn. From left, Elizabeth Conway, Abby Banholzer, Maribeth Armenio, Catherine Schwing, William Tarraza, and Vanessa Vasquez. Senior Elizabeth Conway helps to introduce the cardinals. Cardinal Mahony is escorted by senior Maribeth Armenio. Cardinal Egan is escorted by senior Chris Pierno. Cardinal Daniel DiNardo of Galveston-Houston is escorted by senior Pamela Tremblay. Elizabeth Conway introduces Bishop Olmsted, escorted by senior Olivia Povedano. Scottsdale native Vanessa Vasquez, a junior music major, sings the national anthem. Guests at the Cardinals Dinner enjoy an elegant meal at the Hyatt Regency Scottsdale Resort and Spa at Gainey Ranch. President Garvey addresses the audience at the 2011 Cardinals Dinner. Vanessa Vasquez sings "In the Dark Pine-Wood." Archbishop Pietro Sambi, apostolic nuncio, speaks on Catholic education. Cardinal George delivers the benediction at the 2011 Cardinals Dinner. Vanessa Vasquez and her parents Jorge and Vivian Vasquez meet Bishop Olmsted following the dinner.